Is your latex ethically manufactured/made and environmentally conscious/aware? Because there is no manufacture of latex in Australia it is very important where and how your latex is made. Latexco products comply with the EuroLATEX ECO-Standard. The tests were developed with TFI (Aachen) and define substances considered toxic or harmful to health. We are compliant with standards for food packaging. Latexco’s management has always been committed to the environmental aspects of latex foam production. 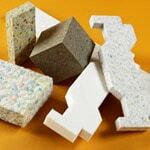 A high-quality product must be environmentally compatible if it is to be accepted by our customers. Economic efficiency and environmental protection are therefore closely interlinked with our innovative processes. In 2003 Latexco participated in the Flemish Covenant Energy Benchmarking. This Covenant aims at a maximum contribution from industry to the rational use of energy and to the objectives of greenhouse gas emission reduction according to the Kyoto protocol. By participating in the covenant Latexco commits itself to bringing and/or keeping the energy efficiency of its process installations to the best international standard by 2012, taking into account continuous improvement of these standards. In 2000 Latexco started looking for innovative water purification techniques to maximise re-use of water. Early 2002, the company started up an evaporation plant to purify the waste water until it became reusable as process water. Latexco significantly reduced the use of water compared to 2001 levels, with a reduction of at least 45%. There has also been a drastic reduction of over 90% in the amount of waste water discharged. 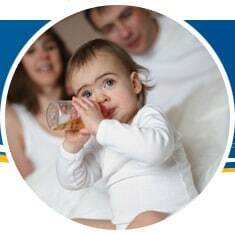 The amount of purification sludge and the use of chemicals has been more than halved. The foundation in 1998 of Latexco Recycling clearly demonstrates the leadership role Latexco wants to play in the recycling of production scrap into sports mats, packaging and insulation materials. Now, so many years later, Latexco Recycling produces products that are being used in seven industrial branches. More information: www.latexco-recycling.be. Latexco Belgium contributes to the protection of the environment through a system of selective collecting, sorting, recycling and useful application of used industrial packings (Val-I-Pac). Over the years Latexco was on many occasions nominated and awarded for its efforts regarding the environment. Latexco has been awarded the label “Passed for harmful substances according to Ökotex Standard 100“, analyzing specific substances which are ecologically hazardous for humans. Latexco is granted by ÖTI (Wien) for its standard latex and also for its natural latex core for mattress and upholstered furniture industry. The Innergetic product line has also been awarded the Ökotex label. LGA (Nürnberg) awarded Latexco with a score of minimum 99% out of 100% (being the maximum) for their dynamic load performance criteria on loss of height, loss of hardness and loss of elasticity. Latexco latex foam products fulfil the criteria of the European Ecolabel system for mattresses as determined in the directive 2002/740/EC. 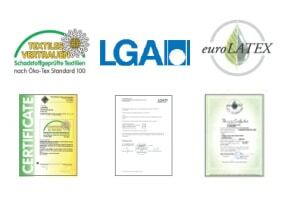 By means of the Latexco Eurolatex and LGA-certificate, customers can obtain a European environmental quality label. The European Eco-label gives your product a credible sign of environmental excellence and offers our customers a simple and trustworthy solution to differentiate their final products. 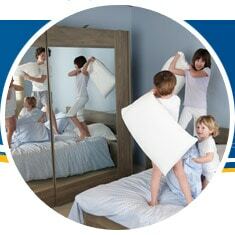 In addition it helps to demonstrate the durability and the quality of the product. Well thought-out logistic concepts based on the most modern techniques and supported by a reliable ICT-system guarantee our customers a high service level. A modern computer park and network, intelligent administrative and logistic solutions, radio frequency-guided terminals in state-of-the-art warehouses with computer-controlled mobile shelves and abundant storage capacity results in a competitive logistical service 24 hours a day, 7 days a week.